Chronic hepatitis C virus infection is a global health problem, especially among renal transplant recipients. Herein, we present an overview of hepatitis C virus among renal transplant patients, with a focus on some updated aspects concerning types of viral genotypes, methods of diagnosis, the effects of renal transplant on hepatitis C virus infection, and summary of hepatitis C virus-related complications after renal transplant. We also discuss patient and graft survival rates and the present and future therapeutic options with special focus on new antiviral and possible interactions with immunosuppressive medications. A systematic literature search was conducted using PubMed, EMBASE, and the Cochrane Library for “HCV” and “renal transplant recipients,” as well as synonyms for “new antiviral.” A total of 110 studies were included in this review. Of major clinical importance is the documentation of chronic HCV severity in all patient settings, including for patients on dialysis. Novel noninvasive methods are used to validate hepatic fibrosis. Transient elastography (Fibroscan, a standard ultrasound machine with a new technology that assesses the stiffness of the liver) evaluates the degree of fibrosis by measuring liver stiffness,17 whereas aspartate aminotransferase-to platelet-index is a noninvasive alternative. In hemodialysis patients, elastography has shown hopeful results in 1 study, 18 but it will need to be authenticated in larger cohorts. On the other hand, this index has shown low diagnostic accuracy. 19 Thus, liver biopsy remains the criterion standard in the evaluation of chronic hepatitis C.
Chronic liver disease after renal transplant depends on many risk factors, such as the pretransplant duration and the severity of HCV infection, liver histopathology, coinfection with hepatitis B virus, duration after transplant, and type of induction and maintenance immunosuppression.17 Some studies have shown no adverse effects of antibody induction on patient survival21 despite the increase of viral load up to 30 times compared with levels before transplant in HCV RNA-positive patients. This finding suggested that immunosuppressives have a role regarding this issue. Mycophenolate mofetil22 and antithymocyte globulin increase HCV viremia, whereas cyclo­sporine inhibits the replication of HCV in cultured hepatocytes.23 Apart from cases with fibrosing cholestatic hepatitis, HCV infection usually has a benign course after renal transplant,24 with normal transaminase levels in 20% to 51% of cases.25 In a meta-analysis, the cause-specific mortality due to chronic HCV hepatic disease complications (cirrhosis or HCC) in kidney transplant recipients was increased in most of the studies compared with HCV-negative cases (relative risk [RR] of 1.79).21 An increased risk of cirrhosis and HCC was reported among HCV-infected patients after kidney transplant compared with those infected before transplant; however, the progression of liver disease is slow and does not occur in all patients.23 It was reported that faster progression of liver histologic activity and fibrosis in kidney transplant recipients compared with nonimmunocompromised patients infected by HCV, whereas Alric and associates 26 detected a slow progression of liver fibrosis in HCV-infected kidney transplant patients, a finding that was inferior to that observed in infected patients with a normal renal function. The use of different immunosuppressive protocols might explain these discrepancies. Torres and associates38 reported HCV infection as the most important risk factor for posttransplant tuberculosis; they suggested that, in immuno­logically low-risk patients, either rapamycin-based or cyclosporine-based protocols should be used with steroid avoidance. However, the optimal immuno­suppressive regimen for HCV-infected patients has not yet been determined, especially with immuno­logically high-risk patients. The survival of HCV-positive renal transplant recipients is significantly better than matched patients who remain on dialysis,40 although infection is associated with lower patient and graft survival compared with HCV-negative patients.41 However, the short-term outcome is similar in both HCV-infected and noninfected cases.Cardiovascular disease was more prevalent in patients who tested positive for HCV antibodies, and chronic HCV infection has been recognized as a risk factor for atherosclerosis.42 The high incidence of NODAT in HCV-positive recipients, especially for those maintained on tacrolimus, was suggested as a possible explanation for lower patient survival.43 In a multivariate analysis, it was found that independent risk factors that adversely affect the long-term outcome included biopsy-proven cirrhosis, older age, and duration of transplant, with 21% of deaths caused by liver disease in HCV-positive patients.44 A lesser outcome was partially related to an increase in liver disease-related deaths and the higher frequency of both hepatic and extrahepatic complications in HCV-positive versus HCV-negative recipients. Heavy immunosuppression could increase the risk of HCV viral replication after renal transplant, especially with the use of quadruple therapy with monoclonal or polyclonal antibodies. However, Luan and associates44 reported that antibody induction did not adversely affect patient surv ival with HCV infection. Therefore, all conventional current immunosuppressive drugs, especially cyclosporine with its viral inhibitory effects, can be used in HCV-positive patients.17,26 The higher risk of NODAT can be minimized by low-dose tacrolimus combined with mycophenolate mofetil and with a steroid-free regimen. The influence of mammalian target of rapamycin inhibitors (sirolimus and everolimus) on patient survival after renal transplant is unknown. The development of these new drugs might change the present course of HCV infection in dialysis and renal transplant patients. The current limitations include the absence of evidence to support the use of DAAs in the setting of renal transplant in addition to their high economic cost. The choice of maintenance immunosuppression may affect outcomes of HCV antiviral therapy. Several studies have reported higher SVR rates in patients who receive cyclosporine versus those who receive tacrolimus because of a lower risk of relapse. The proposed mechanism is thought to be from a direct antiviral effect of cyclosporine through inhibition of NS5B binding to cyclophilin B. However, there is no strong evidence supporting the switch of patients to cyclosporine before commencement of antiviral therapy.72 Data on the use of telaprevir in healthy volunteers resulted in a significant increase in cyclosporine (5-fold) and tacrolimus levels (70-fold) due to the inhibition of the cytochrome P4503A metabolic pathway. The required reduction in tacrolimus dosing (80%-95%) is greater than that for cyclosporine (50%-75%).73 An early report demo­nstrated significant drug-drug interactions between calcineurin inhibitors and boceprevir in 5 liver transplant patients. Reductions in cyclosporine dose by 50% and up to 80% reductions in tacrolimus dose were required, with steady levels being accom­plished by 4 days. Meticulous management of immunosuppression agents with protease inhibitor-based therapy avoids graft dysfunction and rejection. In an open-label phase II study, 30 liver transplant recipients with compensated recurrent hepatitis C (HCV genotype 1 only) were treated with triple DAA regimen combined with ribavirin for 24 weeks.76 Careful adjustment of the calcineurin inhibitor dose was required because of the inhibition of CYP3A4 by the ritonavir. With the fast evolution of antiviral agents, we are expecting more therapeutic modalities among kidney transplant recipients, which will be reflected in patient and graft outcomes. World Health Organization Web site. www.who.int. Accessed November 7, 2016. Rein DB, Wittenborn JS, Weinbaum CM, Sabin M, Smith BD, Lesesne SB. Forecasting the morbidity and mortality associated with prevalent cases of pre-cirrhotic chronic hepatitis C in the United States. Dig Liver Dis. 2011;43(1):66-72. Davila JA, Morgan RO, Shaib Y, McGlynn KA, El-Serag HB. Hepatitis C infection and the increasing incidence of hepatocellular carcinoma: a population-based study. Gastroenterology. 2004;127(5):1372-1380. Lee MH, Yang HI, Lu SN, et al. Chronic hepatitis C virus infection increases mortality from hepatic and extrahepatic diseases: a community-based long-term prospective study. J Infect Dis. 2012;206(4):469-477. Bukh J, Miller RH, Purcell RH. Genetic heterogeneity of hepatitis C virus: quasispecies and genotypes. Semin Liver Dis. 1995;15(1):41-63. Simmonds P, Bukh J, Combet C, et al. Consensus proposals for a unified system of nomenclature of hepatitis C virus genotypes. Hepatology. 2005;42(4):962-973. Lin HJ, Lau JY, Lauder IJ, Shi N, Lai CL, Hollinger FB. The hepatitis C virus genome: a guide to its conserved sequences and candidate epitopes. Virus Res. 1993;30(1):27-41. Antaki N, Craxi A, Kamal S, et al. 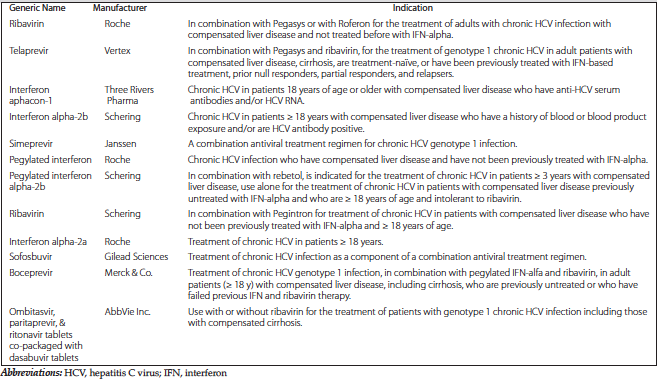 The neglected hepatitis C virus genotypes 4, 5 and 6: an international consensus report. Liver Int. 2010;30(3):342-355. Murphy EL, Bryzman SM, Glynn SA, et al. Risk factors for hepatitis C virus infection in United States blood donors. NHLBI Retrovirus Epidemiology Donor Study (REDS). Hepatology. 2000;31(3):756-762. Ashry Ahmed Gheith O. Dilemma of HCV infection in renal transplant recipients. Int J Nephrol. 2011;2011:471214. Covic A, Abramowicz D, Bruchfeld A, et al. Endorsement of the Kidney Disease Improving Global Outcomes (KDIGO) hepatitis C guidelines: a European Renal Best Practice (ERBP) position statement. Nephrol Dial Transplant. 2009;24(3):719-727. Liu CH, Kao JH. Treatment of hepatitis C virus infection in patients with end-stage renal disease. J Gastroenterol Hepatol. 2011;26(2):228-239. Khedmat H, Amini M, Ghamar-Chehreh ME, Agah S. Hepatitis C virus infection in dialysis patients. Saudi J Kidney Dis Transpl. 2014;25(1):1-8. Hinrichsen H, Leimenstoll G, Stegen G, et al. Prevalence and risk factors of hepatitis C virus infection in haemodialysis patients: a multicentre study in 2796 patients. Gut. 2002;51(3):429-433. Panel AIHG. Hepatitis C guidance: AASLD-IDSA recommendations for testing, managing, and treating adults infected with hepatitis C virus. Hepatology. 2015;62(3):932-954. Gordon FD, Kwo P, Ghalib R, et al. Peginterferon-alpha-2b and ribavirin for hepatitis C recurrence postorthotopic liver transplantation. J Clin Gastroenterol. 2012;46(8):700-708. Kidney Disease: Improving Global O. KDIGO clinical practice guidelines for the prevention, diagnosis, evaluation, and treatment of hepatitis C in chronic kidney disease. Kidney Int Suppl. 2008(109):S1-99. Liu CH, Liang CC, Huang KW, et al. Transient elastography to assess hepatic fibrosis in hemodialysis chronic hepatitis C patients. Clin J Am Soc Nephrol. 2011;6(5):1057-1065. Liu CH, Liang CC, Liu CJ, et al. The ratio of aminotransferase to platelets is a useful index for predicting hepatic fibrosis in hemodialysis patients with chronic hepatitis C. Kidney Int. 2010;78(1):103-109. Pawa S, Ehrinpreis M, Mutchnick M, Janisse J, Dhar R, Siddiqui FA. Percutaneous liver biopsy is safe in chronic hepatitis C patients with end-stage renal disease. Clin Gastroenterol Hepatol. 2007;5(11):1316-1320. Fabrizi F, Martin P, Dixit V, Bunnapradist S, Dulai G. Hepatitis C virus antibody status and survival after renal transplantation: meta-analysis of observational studies. Am J Transplant. 2005;5(6):1452-1461. Rostaing L, Izopet J, Sandres K, Cisterne JM, Puel J, Durand D. Changes in hepatitis C virus RNA viremia concentrations in long-term renal transplant patients after introduction of mycophenolate mofetil. Transplantation. 2000;69(5):991-994. Watashi K, Hijikata M, Hosaka M, Yamaji M, Shimotohno K. Cyclosporin A suppresses replication of hepatitis C virus genome in cultured hepatocytes. Hepatology. 2003;38(5):1282-1288. Morales JM, Campistol JM, Andres A, Rodicio JL. Hepatitis C virus and renal transplantation. Curr Opin Nephrol Hypertens. 1998;7(2):177-183. Vosnides GG. Hepatitis C in renal transplantation. Kidney Int. 1997;52(3):843-861. Alric L, Di-Martino V, Selves J, et al. Long-term impact of renal transplantation on liver fibrosis during hepatitis C virus infection. Gastroenterology. 2002;123(5):1494-1499. Cruzado JM, Gil-Vernet S, Ercilla G, et al. Hepatitis C virus-associated membranoproliferative glomerulonephritis in renal allografts. J Am Soc Nephrol. 1996;7(11):2469-2475. Morales JM, Pascual-Capdevila J, Campistol JM, et al. Membranous glomerulonephritis associated with hepatitis C virus infection in renal transplant patients. Transplantation. 1997;63(11):1634-1639. Baid S, Pascual M, Williams WW, Jr., et al. Renal thrombotic microangiopathy associated with anticardiolipin antibodies in hepatitis C-positive renal allograft recipients. J Am Soc Nephrol. 1999;10(1):146-153. Markowitz GS, Cheng JT, Colvin RB, Trebbin WM, D'Agati VD. Hepatitis C viral infection is associated with fibrillary glomerulonephritis and immunotactoid glomerulopathy. J Am Soc Nephrol. 1998;9(12):2244-2252. Perico N, Cattaneo D, Bikbov B, Remuzzi G. Hepatitis C infection and chronic renal diseases. Clin J Am Soc Nephrol. 2009;4(1):207-220. Wornle M, Schmid H, Banas B, et al. Novel role of toll-like receptor 3 in hepatitis C-associated glomerulonephritis. Am J Pathol. 2006;168(2):370-385. Petrarca A, Rigacci L, Caini P, et al. Safety and efficacy of rituximab in patients with hepatitis C virus-related mixed cryoglobulinemia and severe liver disease. Blood. 2010;116(3):335-342. Bloom RD, Lake JR. Emerging issues in hepatitis C virus-positive liver and kidney transplant recipients. Am J Transplant. 2006;6(10):2232-2237. Forman JP, Tolkoff-Rubin N, Pascual M, Lin J. Hepatitis C, acute humoral rejection, and renal allograft survival. J Am Soc Nephrol. 2004;15(12):3249-3255. Seron D, Arias M, Campistol JM, Morales JM, Spanish Chronic Allograft Nephropathy Study G. Late renal allograft failure between 1990 and 1998 in Spain: a changing scenario. Transplantation. 2003;76(11):1588-1594. Torres J, Aguado JM, San Juan R, et al. Hepatitis C virus, an important risk factor for tuberculosis in immunocompromised: experience with kidney transplantation. Transpl Int. 2008;21(9):873-878. Caillard S, Agodoa LY, Bohen EM, Abbott KC. Myeloma, Hodgkin disease, and lymphoid leukemia after renal transplantation: characteristics, risk factors and prognosis. Transplantation. 2006;81(6):888-895. Ingsathit A, Kamanamool N, Thakkinstian A, Sumethkul V. Survival advantage of kidney transplantation over dialysis in patients with hepatitis C: a systematic review and meta-analysis. Transplantation. 2013;95(7):943-948. Juszczyk J. [Fifteen years of investigations on hepatitis C virus in Poland]. Przegl Epidemiol. 2005;59(2):373-384. Adinolfi LE, Zampino R, Restivo L, et al. Chronic hepatitis C virus infection and atherosclerosis: clinical impact and mechanisms. World J Gastroenterol. 2014;20(13):3410-3417. Singh N, Neidlinger N, Djamali A, et al. The impact of hepatitis C virus donor and recipient status on long-term kidney transplant outcomes: University of Wisconsin experience. Clin Transplant. 2012;26(5):684-693. Luan FL, Schaubel DE, Zhang H, et al. Impact of immunosuppressive regimen on survival of kidney transplant recipients with hepatitis C. Transplantation. 2008;85(11):1601-1606. Rostami Z, Nourbala MH, Alavian SM, Bieraghdar F, Jahani Y, Einollahi B. The impact of Hepatitis C virus infection on kidney transplantation outcomes: A systematic review of 18 observational studies: The impact of HCV on renal transplantation. Hepat Mon. 2011;11(4):247-254. Del Bello D, Ross MJ, Huprikar SS. Hepatitis C virus infection and kidney transplantation: newer options and a brighter future ahead? Kidney Int. 2015;88(2):223-225. Kucirka LM, Singer AL, Ros RL, Montgomery RA, Dagher NN, Segev DL. Underutilization of hepatitis C-positive kidneys for hepatitis C-positive recipients. Am J Transplant. 2010;10(5):1238-1246. Basse G, Ribes D, Kamar N, et al. Rituximab therapy for mixed cryoglobulinemia in seven renal transplant patients. Transplant Proc. 2006;38(7):2308-2310. Reese PP, Abt PL, Blumberg EA, Goldberg DS. Transplanting Hepatitis C-Positive Kidneys. N Engl J Med. 2015;373(4):303-305. Kamar N, Ribes D, Izopet J, Rostaing L. Treatment of hepatitis C virus infection (HCV) after renal transplantation: implications for HCV-positive dialysis patients awaiting a kidney transplant. Transplantation. 2006;82(7):853-856. Levitsky J, Doucette K, Practice ASTIDCo. Viral hepatitis in solid organ transplantation. Am J Transplant. 2013;13 Suppl 4:147-168. Belga S, Doucette KE. Hepatitis C in non-hepatic solid organ transplant candidates and recipients: A new horizon. World J Gastroenterol. 2016;22(4):1650-1663. Fabrizi F, Penatti A, Messa P, Martin P. Treatment of hepatitis C after kidney transplant: a pooled analysis of observational studies. J Med Virol. 2014;86(6):933-940. Schmitz V, Kiessling A, Bahra M, et al. Peginterferon alfa-2b plus ribavirin for the treatment of hepatitis C recurrence following combined liver and kidney transplantation. Ann Transplant. 2007;12(3):22-27. Hassan Q, Roche B, Buffet C, et al. Liver-kidney recipients with chronic viral hepatitis C treated with interferon-alpha. Transpl Int. 2012;25(9):941-947. 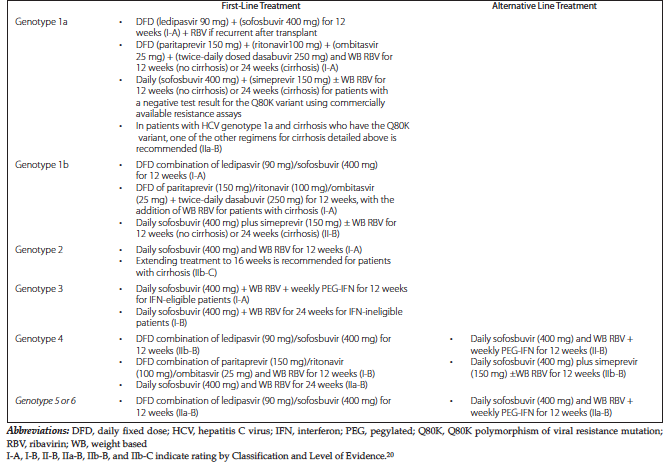 Fabrizi F, Aghemo A, Messa P. Hepatitis C treatment in patients with kidney disease. Kidney Int. 2013;84(5):874-879. Yau AH, Yoshida EM. Hepatitis C drugs: the end of the pegylated interferon era and the emergence of all-oral interferon-free antiviral regimens: a concise review. Can J Gastroenterol Hepatol. 2014;28(8):445-451. Lens S, Gambato M, Londono MC, Forns X. Interferon-free regimens in the liver-transplant setting. Semin Liver Dis. 2014;34(1):58-71. Fabrizi F, Messa P, Martin P. Update to hepatitis C review. Kidney Int. 2014;85(5):1238-1239. Childs-Kean LM, Hand EO. Simeprevir and sofosbuvir for treatment of chronic hepatitis C infection. Clin Ther. 2015;37(2):243-267. Pungpapong S, Aqel B, Leise M, et al. Multicenter experience using simeprevir and sofosbuvir with or without ribavirin to treat hepatitis C genotype 1 after liver transplant. Hepatology. 2015;61(6):1880-1886. Burgess S, Partovi N, Yoshida EM, Erb SR, Azalgara VM, Hussaini T. Drug Interactions With Direct-Acting Antivirals for Hepatitis C: Implications for HIV and Transplant Patients. Ann Pharmacother. 2015;49(6):674-687. Sulkowski M, Hezode C, Gerstoft J, et al. Efficacy and safety of 8 weeks versus 12 weeks of treatment with grazoprevir (MK-5172) and elbasvir (MK-8742) with or without ribavirin in patients with hepatitis C virus genotype 1 mono-infection and HIV/hepatitis C virus co-infection (C-WORTHY): a randomised, open-label phase 2 trial. Lancet. 2015;385(9973):1087-1097. Pawlotsky JM. New hepatitis C virus (HCV) drugs and the hope for a cure: concepts in anti-HCV drug development. Semin Liver Dis. 2014;34(1):22-29. Dumortier J, Guillaud O, Gagnieu MC, et al. Anti-viral triple therapy with telaprevir in haemodialysed HCV patients: is it feasible? J Clin Virol. 2013;56(2):146-149. Chopp S, Vanderwall R, Hult A, Klepser M. Simeprevir and sofosbuvir for treatment of hepatitis C infection. Am J Health Syst Pharm. 2015;72(17):1445-1455. Delabaudiere C, Lavayssiere L, Dorr G, et al. Successful treatment of fibrosing cholestatic hepatitis with pegylated interferon, ribavirin and sofosbuvir after a combined kidney-liver transplantation. Transpl Int. 2015;28(2):255-258. FDA Web site. FDA approves first combination pill to treat hepatitis C. http://www.fda.gov/NewsEvents/Newsroom/PressAnnouncements/ucm418365.htm. Accessed November 7, 2016. Gruener NH, Jung MC, Ulsenheimer A, et al. Analysis of a successful HCV-specific CD8+ T cell response in patients with recurrent HCV-infection after orthotopic liver transplantation. Liver Transpl. 2004;10(12):1487-1496. Rabie R, Mumtaz K, Renner EL. Efficacy of antiviral therapy for hepatitis C after liver transplantation with cyclosporine and tacrolimus: a systematic review and meta-analysis. Liver Transpl. 2013;19(1):36-48. Verna EC, Saxena V, Burton JR, Jr., et al. Telaprevir- and boceprevir-based triple therapy for hepatitis C in liver transplant recipients with advanced recurrent disease: A Multicenter Study. Transplantation. 2015;99(8):1644-1651. Kowdley KV, Lawitz E, Poordad F, et al. Phase 2b trial of interferon-free therapy for hepatitis C virus genotype 1. N Engl J Med. 2014;370(3):222-232. Sulkowski MS, Gardiner DF, Rodriguez-Torres M, et al. Daclatasvir plus sofosbuvir for previously treated or untreated chronic HCV infection. N Engl J Med. 2014;370(3):211-221. Gane EJ, Agarwal K. Directly acting antivirals (DAAs) for the treatment of chronic hepatitis C virus infection in liver transplant patients: “a flood of opportunity.” Am J Transplant. 2014;14(5):994-1002. Acknowledgements: The authors received no financial support for this study and have no conflicts of interest to declare. Author contributions: O Gheith contributed to the conception and design of the study, literature review and analysis, drafting and critical revision and editing, and approval of the final version; N Nampoory, MA Halim, N Othman, and T Al-Otaibi shared equally in this review by literature review and analysis, drafting, and critical revision. Current address for O Gheith and N Othman: Hamed Al-Essa Organ Transplant Center and Education Department, Dasman Diabetes Institute, Kuwait.